Srikanth Pilla joined CU-ICAR in August 2013 as an Assistant Professor of Automotive Engineering. Prior to coming to CU-ICAR, Dr. Pilla was Assistant Scientist at the Wisconsin Institute for Discovery, University of Wisconsin-Madison. Dr. Pilla also has industrial experiences at SC Johnson and Son Inc. and SuGanit Biorenewables Inc.
Dr. Pilla received his B.S. degree from JNT University India, MS from University of Toledo and PhD from University of Wisconsin-Milwaukee, all in Mechanical Engineering. He then obtained a postdoctoral training from the department of Civil and Envirnomental Engineering at Stanford University. Dr. Pilla’s research focuses on the mechanics, processing and characterization of polymers, multifunctional composites, nanocomposites, sustainable materials and microcellular foams. His research thrust includes the development of structural foams, biobased and biorenewable materials, gas-assisted foam processing, composites for extreme environments including high-temperature, thermoset composites processing using OOA (UV based) methods, multi-functional materials including self-repairing structural composites, and the evaluation of these materials using experimental mechanics, rheology, thermal, spectroscopic and microscopic analysis. In addition, his work focuses on the chemistry and physics based understanding of joining methods for dissimilar and hybrid materials and structures while investigating the environmental impact through stochastic life-cycle assessment. 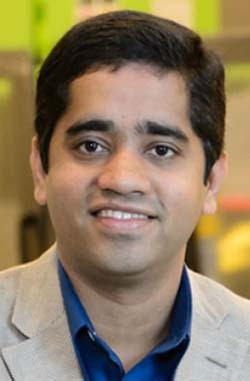 Dr. Pilla is the Associate Editor of SAE International Journal of Materials and Manufacturing, Series Editor of Polymer Science and Plastics Engineering at Wiley-Scrivener and also serves on the editorial board of Journal of Renewable Materials. In addition, Dr. Pilla serves on the board of Injection Molding Division of the Society of Plastics Engineers.